Narrative shifts between letters from Myfanwy-That-Was to the current scramble of Myfanwy-That-Is to solve the mystery of who is trying to kill her. While that had the potential to become a tiresome device, O'Malley uses it well, giving context to Newbie just before she needs to use it, cuing the reader at the same time. Sometimes Senior relates an incident, sometimes she lays out structure and organization, or gives a dossier on other characters. For the most part it was able to maintain pace and tension through the shifts. At times, O'Malley is tongue-in-cheek: right as Myfanwy thinks, "I suppose I should do some more homework on how this organization actually works," the next section is from one of the letters, under the title of "How This Organization Actually Works." I actually found it rather delightful, highlighting the mental similarities in how they process information. "An emergency has emerged, and both you and Rook Gestalt have been summoned to an interrogation," the secretary replied in an unruffled manner. "Oh. Okay." Myfanwy looked down and her desk, thought for a moment, and then looked up. "Are we getting interrogated, or are we doing the interrogating?" she asked. "It's time for your dinner with Lady Farrier." "Oh, crap," she sighed, then noticed Clovis's shocked expression. "I mean, oh, good, this should be delightful." The humor isn't out front in the beginning, which now strikes me as one of the delightful parts about the writing. Tightly wound around an action core at the start, O'Malley sneaks in humor one subtle comment at a time, gradually becoming more absurd. 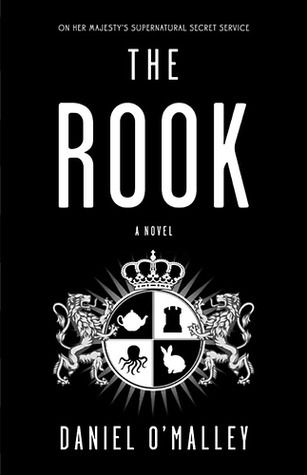 The first hint that we aren't in London any more comes about three chapters in when we meet Rook Gestalt, really one of the more innovative creations in sci-fi/fantasy literature that I've happened upon. One mind, four bodies. I found myself trying to wrap my head around that one (somewhat distracted by comparing it with Zaphod and his two heads) and just got rather smacked with the possibilities. By the end, the absurd veered out of control at a couple of points, but for the most part O'Malley was able to maintain the balance between chuckles and tension. Before too long, the American version of the Court comes to call, and the subtlety gloves come off when the American Bishop Shantay and Myfanwy take on some fungus--after lunch, of course. Truly riveting fun, exactly what I needed after an awful start to the week--it was the ideal book experience of immersion and diversion. Highly recommended to anyone who likes a dose of humor with their surreal action-spy-mystery thriller. Four out of five stars. Or are they?